Just a reminder. 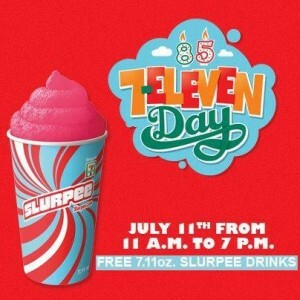 Keeping with their delicious yearly tradition, 7-Eleven will be offering a free 7.11 oz. Slurpee from 11am to 7pm On 7/11. I sure hope that this is also in Fresno,CA!!! Last year, the 7-11 in Plaza Del Mercado in Aspen Hill MD, refused to fulfill their obligation to the deal stating the “ran out of cups”…however, you could purchase a cup if you wanted to, shame on 7-11 poor planning! I wish they would make a sprite or 7 up slurpee.